With ICICI Bank PayLater you can get 30-day interest-free digital credit up to Rs.25,000 with just a click. You can use this money to pay your bills, shop online and pay to any merchant UPI ID easily and instantly. 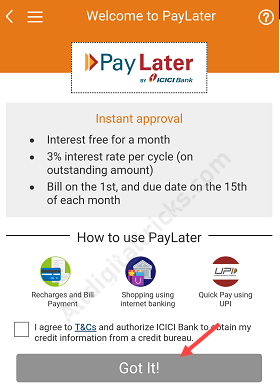 PayLater by ICICI Bank is available to a set of customers on an invite-only basis. The customers for which the facility is available will receive the invite pop-up when they log in to Pockets wallet, iMobile or Internet Banking. The limit of your Pay later account can range between Rs.10000 to Rs.25000, based on your eligibility. The limit will be preset for the customers to whom the invite is sent. 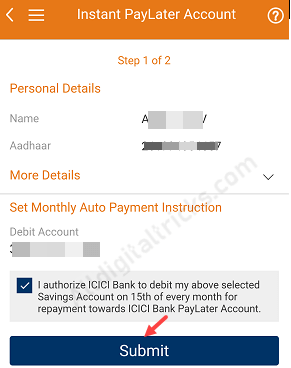 The PayLater dues will be debited automatically from your ICICI Bank Savings Account. The customers for which the facility is available will receive the invite pop-up when they log in to Pockets wallet, iMobile or Internet Banking. 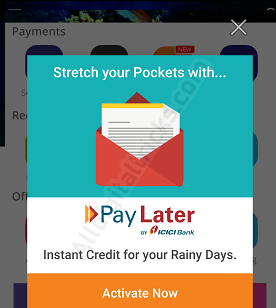 Login to ICICI iMobile App and Click on ‘I’m interested’ on the pop-up invite to create your PayLater account. Check your personal details, Aadhaar number, select the debit account, select the checkbox set your debit bank account for auto-payment and Submit your details. 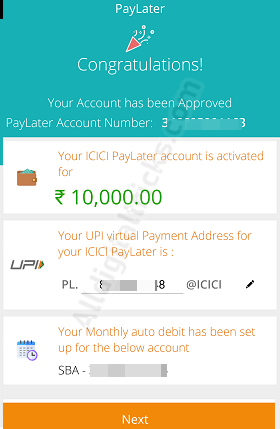 Create your own Virtual Payment Address (UPI ID). Congratulations! Your PayLater account is created. Click on PayLater in the Accounts and Deposits section to see your PayLater account details. 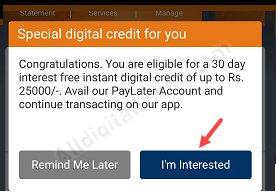 Click on ‘Activate Now’ on the pop-up invite to create your PayLater account. Accept terms and conditions and tap on Got it. 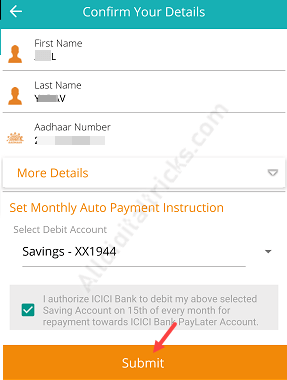 Next screen, check your personal details, select your ICICI account for auto payment. The due amount will be automatically Debited from this account and submit. 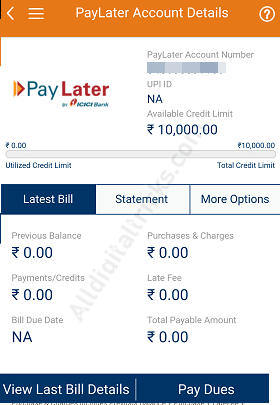 You can also create your UPI ID for online payment. Once your account is created click on the PayLater icon on the Pockets dashboard to see your PayLater account details.